It’s been a week since BCCE 2018 ended and chemical educators everywhere are relaxing or already getting into professional development as the new school year ramps up. Many will incorporate the activities and ideas they learned at the conference into their curricula this year. However, many chemical educators have never attended a BCCE or even heard about it. During the last week of July this year, the Biennial Conference on Chemical Education celebrated 50 years of educators meeting to exchange ideas, activities, and research, all related to chemical education. 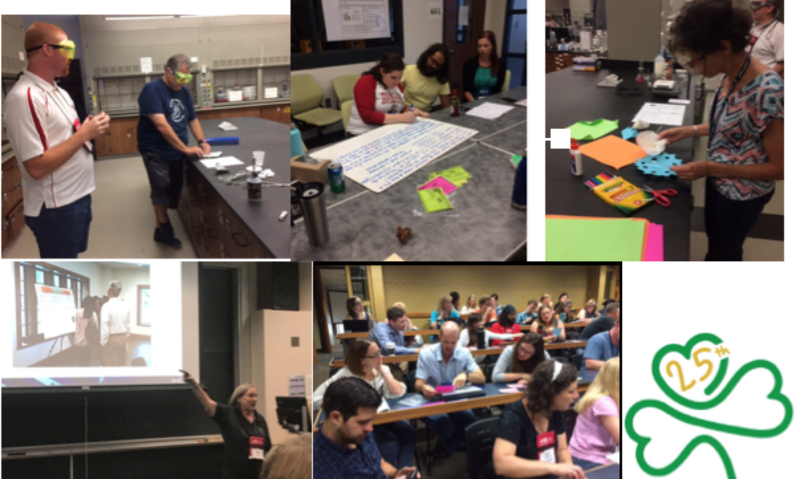 Many of us are familiar with the NSTA and ChemEd format of either 45 or 90 minute talks or workshops, but BCCE is a little bit different. Here are a few nuggets about the format of the conference, a few of the sessions, and why you should think about attending in 2020. BCCE is the official conference of the ACS Division of Chemical Education and it as a rather unique format of workshops and symposia, paired with poster and plenary sessions. The workshops are a full 3 hours, affording participants the chance to really dive right into lab activities and full discussions of pedagogy. A few of the workshops designed for pre-college teachers this year included such topics as, Rethinking Common Practices in HS Chemistry, Demos on a Dime, Beyond the Octet Rule, Relative Strengths of Acids and Bases, Using CER in labs, Take Home Labs, Equilibrium (Big K, Little K), Writing Unit Plans with AACT resources, POGIL activities, and Modeling Equilibrium. Symposia are, for the uninitiated, little clusters of presentations that center on a theme. Each presentation is about 20 minutes and a symposium is 2-3 hours including an intro, talks, a break, and question period. There were several symposia offered, one example of which was: CERtainly You Can Do Inquiry which included Strong/Weak arguments, Discrepant events and CER to avoid misconceptions, Writing inquiry stories to explore science, Enhancing Stoichiometry, Condiment Challenge, Redesigning Your Lab Program using CER as a Unifying Theme. Additional symposia topics incorporated, among others, using manipulatives, chemistry outreach, metacognition, communicating chemistry via social media, modeling chemistry, views from award winning teachers, assessment practices, AP reading review, AP teaching nuggets, and more. Poster sessions are usually presented by students at the collegiate level and offer a chance for participants to read the posters regarding a multitude of topics in chemical research and talk with the authors. Usually these poster sessions are coupled with time to browse the exhibit hall and maybe grab some ice cream at the social! The plenary sessions this year included an historical perspective of BCCE (in honor of the anniversary), a collections of “TED” style talks by Notre Dame faculty (What would you fight for? ), STEM perspectives with movie-science critiques, and Sam Keen, author of several books including The Disappearing Spoon. A highlight of the conference is the last night party featuring food, beverages, camaraderie (which is important always), and a live performance by Al D. Hyde and the Key Tones! The band is composed of chemical educators from all over the country. They gather during the week to rehearse and audition new members. This evening event is a chance to reconnect with old friends and celebrate the week of learning shared by all the participants. It is easy to get to know people when so many like-minded individuals are in the same place. It is a time to dance, sing, and make plans with new colleagues about using the vast array of activities and ideas garnered at the conference. So, why should you put BCCE on your 2020 calendar? Why not? It’s amazing and a true celebration of chemical education. Thinking it’s too much money to travel to the beautiful northwest US where the conference will be held at Corvalis, Oregon, the home of the Oregon State Beavers? Think again! Apply for a HACH grant for professional development! 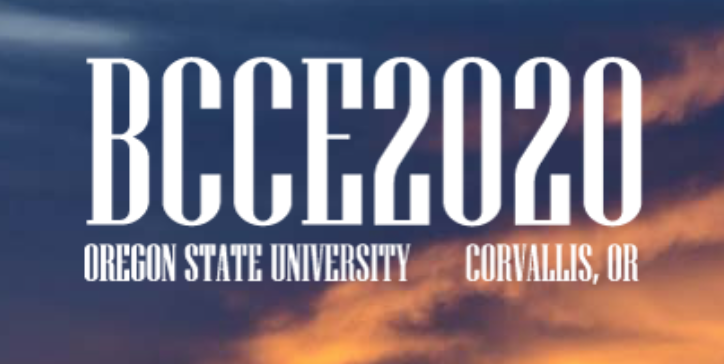 BCCE 2020 is July 18-23, 2020. Seriously, put it on your calendar. Sign up at the BCCE 2020 website to get updates. Another version of this article was published by the authors in the Associated Chemistry Teachers of Texas Reactions Newsletter.